52°North’s Christoph Stasch participated in a series of workshops for RIESGOS project members and local stakeholders in South America in April 2018. These workshops lay the groundwork for creating a Multi-Risk Information and Early Warning System for the Andes region. RIESGOS (Multi-risk analysis and information system components for the Andes region) elaborates novel scientific approaches related to the assessment of different hazards (earthquakes, tsunami, volcanic eruptions, floods, landslides) and risks. These include the analysis of dynamic exposure, vulnerability and the modelling of cascading effects and possible damages. 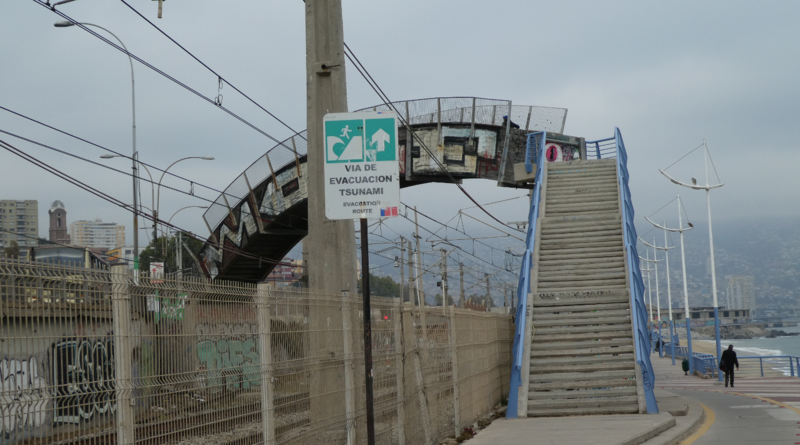 Multi-hazard scenarios are defined for the regions Santiago de Chile/Valparaiso in Chile, Lima in Peru, and Quito in Ecuador. Modular interactive web services will be developed and implemented in a flexible and scalable multi-risk information system demonstrator. This will allow end users from civil protection and disaster management authorities to simulate and analyze complex multi-risk scenarios with the ultimate goal of risk reduction and enhanced disaster management. RIESGOS already collaborates with more than 25 research partners and authorities in the South American partner countries Chile, Peru, and Ecuador and plans to foster this cooperation during the course of the project. Therefore, a series of workshops with 40 – 60 participants and bi-lateral meetings between RIESGOS members and local stakeholders were held in Chile, Peru, and Ecuador. As an example, RIESGOS team members visited the Chilean Navy Hydrographic and Oceanographic Service (SHOA) and had a chance to look at the control center and discuss the RIESGOS approach with SHOA members. SHOA runs the national Tsunami Warning System (“Sistema Nacional de Alarma de Maremotos – SNAM”). Christoph Stasch participated in interesting presentations and discussions about state of the art of research and information systems during workshops held in Chile, Peru and Ecuador. These laid the groundwork for further cooperation during the project. The next milestone is a first showcase that will be presented and discussed with local stakeholders in September/October 2018. More information about the project and the workshops in South America can be found at the RIESGOS website.